Fabrics that are available in the shop.. 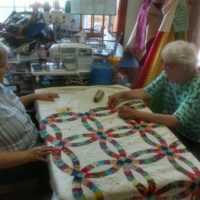 This class was limited to one person due to the difficulty of making such a beautiful quilt. Here at Fabrics In The Fray we try to accommodate our customers and their desire to learn. This quilt was pieced and hand quilted by JoAnn Garfinkle. Truly from the jewel tone batiks to the lace interjected in small amounts and the birthstone colors of the bride and groom that joined each ring this is a very personal quilt.